About 1 Â¼ hours away from the Albany area on Rt 9N. They've got several snow chutes. Tubes range from 50 feet to 1,000 feet. You can get a gentle push from the attendant to start you off or you can spin quickly down a bump-filled route -- depending on how daring you are. There's a route that has a bigger inclines with bumps, another that's faster, and even one that snakes around. Tubers walk their big, inflated tubes up the hills and slide down their chosen chute. of the Adirondacks. They also tow you up the mountain so you won't have to walk. The only problem is that a few other dozen people had the same idea and you may have to wait in a colorful tube line for 30 minutes at a time -- like you're at a theme park in the winter. Runs: Six lanes - two 1,000 feet long with a gradual 100 foot vertical drop and four 700 feet long with a gradual 65 foot vertical drop. It takes about 15 seconds to get to the bottom, on average, and people are allowed to hold onto friends and family members' tubes.No bumps on the chutes. Parents are not allowed to carry children on their laps. There is no height minimum so parents have to decide for themselves if their kids can handle the ride. Open throughout winter as long as they can make snow. Price: $17 for 2 hours, $22 for 4 hours, Groups of 10 or more save $3. This ski resort is about a 45 minute drive from Albany. Usually open until mid-March or as long as they can still make snow. About an hour south of Albany. They allow small groups to hook up and go down chutes together, depending on weather conditions. It takes about 30 seconds to get to the bottom. One side of the hill is steeper, so tubes go a little faster on that side. They have tow ropes, so you can get towed to the top. Space is limited in each 2 hour session. Hours may change so call ahead to reserve times. 800-486-8376. Know any others? Add them to the list. Bosquet over in Pittsfield has tubing. Gore was a simple, safe, straightaway with some undulations in the track. Mt Pisgah was a whole other story - fast, curvy, banging against the sides, almost bouncing out of the tube...I was a little scared. FUN times, both. I also learned that one hour of tubing is quite enough if you have any tendency toward motion sickness. 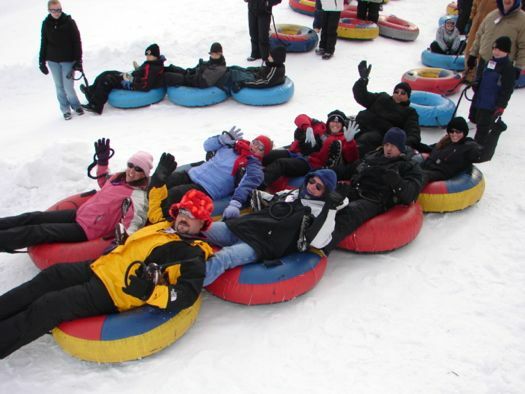 I never though that would be the case since I love sledding, but the tubes can spin, so I was dizzy after 5 runs. West Mountain is great. The only bad thing is you have to wait in line for a long time most of the time you go. Sometimes the hills are so fast people fly over them into the parking lots...lol. i've seen it!